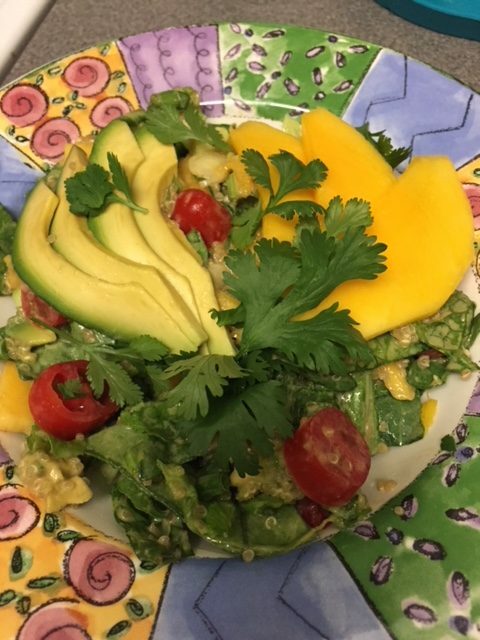 Eating Alkaline sounds hard but this Alkaline Mango Avocado Salad makes it easy! This salad is a perfect example. No cooking, very little cutting, you can make the dressing in this recipe or you can use your favorite organic purchased dressing. 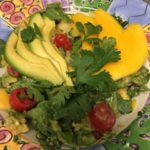 Look at the yummy and also healthy and alkalizing ingredients in this salad…don’t be afraid to add other favorites if you like! The base of the salad is leafy greens, try to have 2-4 handfuls for one person. You can use baby spinach, romaine, leafy greens – you know – spring mix, mixed baby greens with kale, swiss chard, raddico, etc … please don’t use iceberg lettuce, no nutrition there. Do your leafy greens get slimy before you use them? Ours last up to 2 weeks! Watch our Salad Bar Box video to learn how we store them. You can get that by filling in the pop up box when you are on our website! Avocado is another must-have food! It can be an acquired taste, Phil and I once hated avocado…but that was when we were eating junk food. You can get used to the taste and texture of avocados in yummy treats like our Key Lime Pie or Chocolate Cherry Mousse recipe. Avocado is one of the highest enzyme counts of all foods, so you really should not cook them; asparagus is another high enzyme food. Enzymes are the construction crew of the food. They take apart the nutrients and put them to work in the body. Which is why I frrrreeeek out when I see recipes to cook avocado. It’s murder! You are killing the most beneficial part of the food. 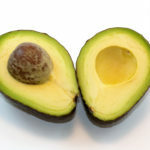 According to Dr. Johanna Budwig, creator of the Budwig diet – a cancer therapy – enzymes in avocados actually break up cancer cells! Read more about the Budwig Diet here. Mangos are not only yummy but also very alkalizing…so this salad is SUPER ALKALINE! Which is helpful to keep your skin clear, cholesterol down, bones strong, etc. Phil, my husband surprised me by saying “I love mangos” when we saw them on sale for 59 cents each … at Aldi’s! We bought 6 and thus, this salad. I also love to add mango to smoothies, pico de gallo, and of course just munch on one for a snack. Learn more about the health benefits of mangos. The other ingredients are also healthy … but let’s just get this made! It will take you about 15 minutes to create this salad for 4 people! Get out your ingredients and your mandoline, knife and cutting board….and get cutting! Oh and the dressing…A-Mazing…it was inspired by Pioneer Woman’s Fajita Marinade. A beautiful and tasty salad full of benefical fats that will make your tastebuds say Thanks! You can make this less spicey by putting less chili powder and replacing the red pepper flakes with ground white pepper.